Advertising, it’s all around. TV, newspapers, magazines or the Internet, the sales of advertising space has never been so prominent. The Digital Out Of Home market or DOOH for short, has grown over the last 10-year and it continues to grow year on year. The emergence of digital signage (digital screens running advertisements and information), initially located in retail shopping centres, has evolved into most areas of our lives. From airports and railway stations, large outdoor roadside displays to smaller displays in doctor’s waiting room, reception areas of hotels and corporate headquarters, digital signage is everywhere we go. So as an advertiser and with so much space available, you need to identify your audience so that you can target the correct messages towards them. Digital signage advertising is all about getting brand awareness to your potential customers. Digital signage is used to reinforce a message that a person may have seen in their home, in a magazine or on TV. If a person has seen an advertisement on TV, they may just forget it. But providing a reinforcing message at the point of sale can remind the person and may persuade them to make a purchase. Reinforcing your message is proven to increase sales. TV, newspapers and magazines are all media formats that we all still used today, but adverting on these formats is in decline. The fast pace of life today means some people do not have the time to sit and read or watch these mediums. Constantly on the move they need advertising to follow them. 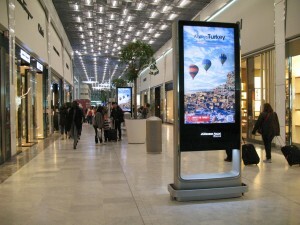 Digital signage can deliver your ad to anywhere there is an out of home audience. 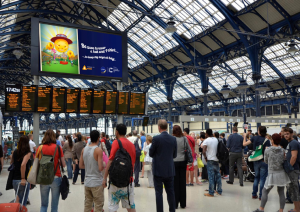 High volumes of potential customers can be targeted and influenced by digital screens placed in locations were dwell time occurs most. Dwell time is a when a customer is static for a period of time. This may be standing waiting for a train, queuing at a supermarket checkout or sat waiting to see their doctor. These are all great opportunities to get your message across. Dwell time has an impact on the length or ads that you show. In an ideal world you would want you viewer to see your ad a few times before they depart. Short adverts of 10-20 second are usually Ok, but the frequency your ads are shown will also depend on the total number of ads in the playlist loop. If you are not running the signage network then ask your provider for the loop length and the frequency you ad will show. The other advantage digital signage has over tradition static formats is “dynamic content”. Advertisements directed at point of sale customers can visually attract shoppers with eye-catching content reinforcing brands and promoting products. This advertising is not seen as intrusive by users, who are attracted voluntarily by their content, unlike commercials and online ads that can be placed between the user and the information they are viewing, so use dynamic eye candy to attract your viewers. Digital signage operators can provide Proof Of Play Reports. These reports can be presented to the advertiser as proof that the advertisement ran and the locations that it was delivered to. In addition to these Proof Of Play reports, viewing statistics can now also be shown with the addition of mounted audience measurement cameras. These cameras together with some clever software can show what gender and age the viewers are and analyze this in real time. This is also great for planning future advertising campaigns as this data can be used to create specific ads targeting a specific gender or age. Companies like Quividi and Seemetrix can provide bolt on systems to enhance any digital signage system. Get the proof you need on viewers and their behaviour. Need more advice and tips? This entry was posted in Digital Signage and tagged #digitalsignage, digital signage, digital signage advertising, digital signage news, Digital signage retail by Dynamax. Bookmark the permalink.